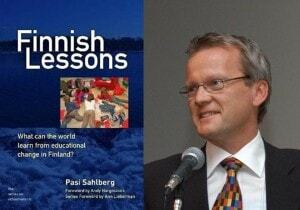 Finland’s Pasi Sahlberg is one of the world’s leading experts on school reform and the author of the best-selling“Finnish Lessons: What Can the World Learn About Educational Change in Finland?” In this piece he writes about whether the emphasis that American school reformers put on “teacher effectiveness” is really the best approach to improving student achievement. He is director general of Finland’s Centre for International Mobility and Cooperation and has served the Finnish government in various positions and worked for the World Bank in Washington D.C. He has also been an adviser for numerous governments internationally about education policies and reforms, and is an adjunct professor of education at the University of Helsinki and University of Oulu. He can be reached at pasi.sahlberg@cimo.fi. Many governments are under political and economic pressure to turn around their school systems for higher rankings in the international league tables. Education reforms often promise quick fixes within one political term. Canada, South Korea, Singapore and Finland are commonly used models for the nations that hope to improve teaching and learning in their schools. In search of a silver bullet, reformers now turn their eyes on teachers, believing that if only they could attract “the best and the brightest” into the teaching profession, the quality of education would improve. “Teacher effectiveness” is a commonly used term that refers to how much student performance on standardized tests is determined by the teacher. This concept hence applies only to those teachers who teach subjects on which students are tested. Teacher effectiveness plays a particular role in education policies of nations where alternative pathways exist to the teaching profession. In recent years the “no excuses”’ argument has been particularly persistent in the education debate. There are those who argue that poverty is only an excuse not to insist that all schools should reach higher standards. Solution: better teachers. Then there are those who claim that schools and teachers alone cannot overcome the negative impact that poverty causes in many children’s learning in school. Solution: Elevate children out of poverty by other public policies. For me the latter is right. In the United States today, 23 percent of children live in poor homes. In Finland, the same way to calculate child poverty would show that figure to be almost five times smaller. The United States ranked in the bottom four in the recent United Nations review on child well-being. Among 29 wealthy countries, the United States landed second from the last in child poverty and held a similarly poor position in “child life satisfaction.” Teachers alone, regardless of how effective they are, will not be able to overcome the challenges that poor children bring with them to schools everyday. Finland is not a fan of standardization in education. However, teacher education in Finland is carefully standardized. All teachers must earn a master’s degree at one of the country’s research universities. Competition to get into these teacher education programs is tough; only “the best and the brightest” are accepted. As a consequence, teaching is regarded as an esteemed profession, on par with medicine, law or engineering. There is another “teacher quality” checkpoint at graduation from School of Education in Finland. Students are not allowed to earn degrees to teach unless they demonstrate that they possess knowledge, skills and morals necessary to be a successful teacher. But education policies in Finland concentrate more on school effectiveness than on teacher effectiveness. This indicates that what schools are expected to do is an effort of everyone in a school, working together, rather than teachers working individually. In many under-performing nations, I notice, three fallacies of teacher effectiveness prevail. The third fallacy is that “If any children had three or four great teachers in a row, they would soar academically, regardless of their racial or economic background, while those who have a sequence of weak teachers will fall further and further behind”. This theoretical assumption is included in influential policy recommendations, for instance in “Essential Elements of Teacher Policy in ESEA: Effectiveness, Fairness and Evaluation” by the Center for American Progress to the U.S. Congress. Teaching is measured by the growth of student test scores on standardized exams. Everybody agrees that the quality of teaching in contributing to learning outcomes is beyond question. It is therefore understandable that teacher quality is often cited as the most important in-school variable influencing student achievement. But just having better teachers in schools will not automatically improve students’ learning outcomes. Lessons from high-performing school systems, including Finland, suggest that we must reconsider how we think about teaching as a profession and what is the role of the school in our society. First, standardization should focus more on teacher education and less on teaching and learning in schools. Singapore, Canada and Finland all set high standards for their teacher-preparation programs in academic universities. There is no Teach for Finland or other alternative pathways into teaching that wouldn’t include thoroughly studying theories of pedagogy and undergo clinical practice. These countries set the priority to have strict quality control before anybody will be allowed to teach – or even study teaching! This is why in these countries teacher effectiveness and teacher evaluation are not such controversial topics as they are in the U.S. today. Second, the toxic use of accountability for schools should be abandoned. Current practices in many countries that judge the quality of teachers by counting their students’ measured achievement only is in many ways inaccurate and unfair. It is inaccurate because most schools’ goals are broader than good performance in a few academic subjects. It is unfair because most of the variation of student achievement in standardized tests can be explained by out-of-school factors. Most teachers understand that what students learn in school is because the whole school has made an effort, not just some individual teachers. In the education systems that are high in international rankings, teachers feel that they are empowered by their leaders and their fellow teachers. In Finland, half of surveyed teachers responded that they would consider leaving their job if their performance would be determined by their student’s standardized test results. Third, other school policies must be changed before teaching becomes attractive to more young talents. In many countries where teachers fight for their rights, their main demand is not more money but better working conditions in schools. Again, experiences from those countries that do well in international rankings suggest that teachers should have autonomy in planning their work, freedom to run their lessons the way that leads to best results, and authority to influence the assessment of the outcomes of their work. Schools should also be trusted in these key areas of the teaching profession. I argue that if there were any gains in student achievement they would be marginal. Why? Education policies in Indiana and many other states in the United States create a context for teaching that limits (Finnish) teachers to use their skills, wisdom and shared knowledge for the good of their students’ learning. Actually, I have met some experienced Finnish-trained teachers in the United States who confirm this hypothesis. Based on what I have heard from them, it is also probable that many of those transported Finnish teachers would be already doing something else than teach by the end of their fifth year – quite like their American peers. Conversely, the teachers from Indiana working in Finland—assuming they showed up fluent in Finnish—stand to flourish on account of the freedom to teach without the constraints of standardized curricula and the pressure of standardized testing; strong leadership from principals who know the classroom from years of experience as teachers; a professional culture of collaboration; and support from homes unchallenged by poverty. UNICEF, 2013. Child well-being in rich countries. A comparative overview. Innocenti Report Card 11. Florence: UNICEF. McKinsey & Company (2010). “How the world’s best performing school systems come out on top”. London: McKinsey & Co.
Teddlie, C. (2010). The Legacy of the School Effectiveness Research Tradition, in A. Hargreaves, A. Lieberman, M. Fullan & D. Hopkins (Eds.). The Second International Handbook of Educational Change. Dordrecht: Springer.